The U.S. State of Hawaii has set a goal of 100% renewable electricity generation by the year 2045. Our speaker, Ms. Veronica Rocha, is responsible to lead her government office to achieve this goal. The speaker will present her experiences and on-going challenges towards meeting such an ambitious target, the role of innovators and entrepreneurs, and the possibility of adopting similar ambitious approaches in Armenia. The lecture will be followed by a workshop where the participants will be divided into two groups, one group will be discussing the role of entrepreneurs in achieving 100% renewable energy generation and the second group will brainstorm on the opportunities and challenges in setting a similar target in Armenia. 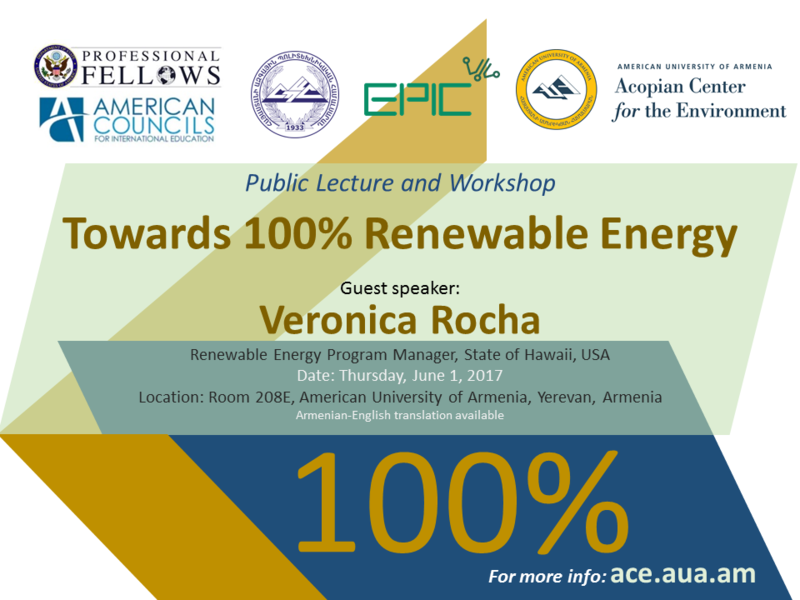 The event is jointly organized by the AUA Acopian Center for the Environment, AUA Entrepreneurship and Product Innovation Center (EPIC), National Polytechnic University of Armenia (NPUA), and the U.S. Department of States’ Professional Fellows Program (PFP) alumna within the “Renewable Energy is the key to Energy independence and economic development” project, which aims to exchange knowledge on energy sector policies, strategies, projects and initiatives. The participants will also become familiar with new engineering programs that AUA and NPUA will launch in Fall 2017 on the topic of renewable energy, resource management, and sustainable development. For more info visit http://ace.aua.am or call +374-60-612520.